In order to enjoy this project, the teacher must save up eggshells so that every student has one, and a few extra for good measure. Ask students’ families to help by saving and bringing in eggshells. This project works best if the shell is relatively intact. When breaking raw eggs, try to crack them at the very edge in order to preserve as much shell as reasonably possible. Break egg containers into squares with four compartments each. The square shape helps ensure that the students will not knock over the egg while working with it. The top of the egg head is the broken edge. Place the eggshell in a compartment and decorate it to look like a face. Use permanent markers or paints to draw eyes and other facial features. Instruct the students to spoon potting soil into their eggshells, all the way up to the top. Sprinkle grass seed on top and gently press the seed into the soil with a finger. Place the egg heads in a sunny window, and give them a little water every day. The eggheads will grow green hair! It is grand fun to cut the hair and then watch it grow back, just like your own head. Students may even have fun giving their egg heads hairstyles. When the class is finished enjoying their egg heads, plant each one directly in the ground. The eggshell will nourish the soil as it decomposes. This lesson plan is a great activity for springtime in elementary classrooms. It complements gardening and new growth themes. 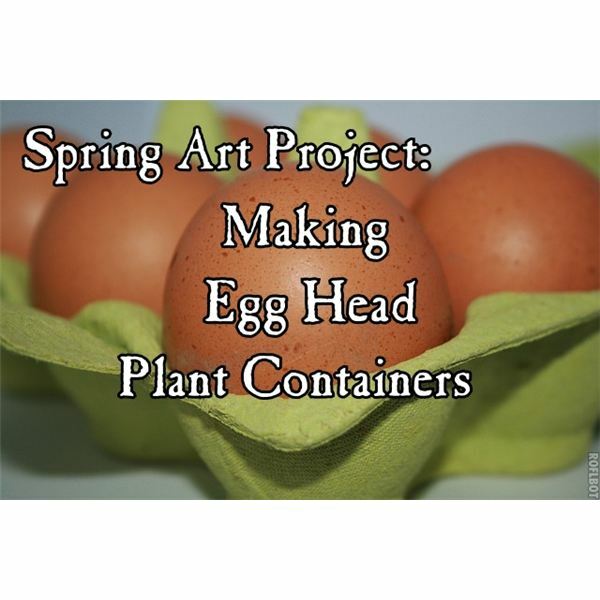 This fun project can be altered for use in schools and childcare centers that dip and decorate Easter eggs. The eggshells can be painted like Easter eggs before they are filled with potting soil. You now have beautiful, decorate Easter egg flowerpots. Instead of grass, try planting one nasturtium seed in each decorated eggshell. Later, the flowers can be transplanted right in their eggs as a group, and form a small nasturtium garden. Plants and photosynthesis lesson plans, activities and ideas! !